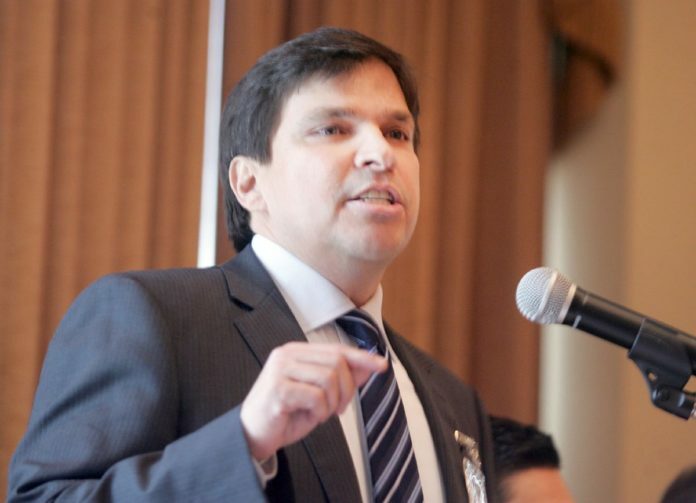 U.S. Rep. Vicente Gonzalez, D-McAllen, is seen in this 2018 file photo speaking at the McAllen Country Club, and at the time filed legislation that would disallow airlines from bumping passengers off an overbooked flight if the passenger has already boarded. Less than a month after videos showed a United Airlines passenger being violently dragged off a flight in Chicago, a local congressman crafted legislation to combat that. U.S. Rep. Vicente Gonzalez, the McAllen Democrat, along with his Republican colleague from Florida, U.S. Rep. Neal Dunn, introduced the Secure Equity in Airline Transportation (SEAT) Act, which would prevent airlines from bumping passengers off an over-booked flight if the passenger has already boarded.